Healthy Fit Goddess: Airplane food upgraded! 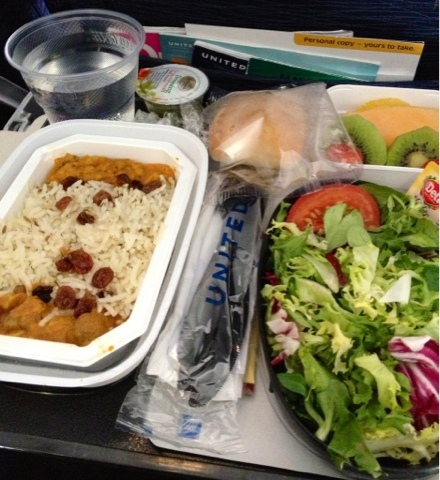 As you know I went on a trip to Ukraine last week and I was actually pleasantly suprised by the airplane food! This was my first long internaitonal trip since I've changed my diet to more plant based so I requested vegan/vegetarian food for the meal when I booked my ticket. Airplane food is notorious for being bad so I really didn't know what to expect but I must say that the veggie option was better than some "vegetarian" options that I've been served at banquets at conferences! Above is a picture of the main meal on my way back from Europe. It was a rice and bean dish with a slight curry flavor. I'd prefer brown rice but I thought it was excellent! The salad was also good with herbs and some other veggies, and even a vegan dressing. The dessert was tropical fruit, my favorite! I already feel like crap on long flights (dehydrated and tired) so eating healthy food made me feel a little better. Fruits and veggies contain a lot of water to help dehydration. 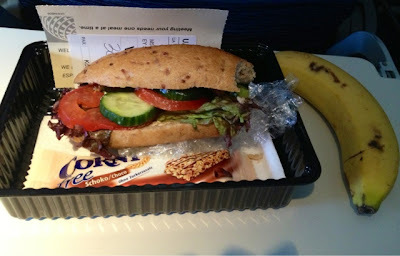 I was also suprised that the snack at the end of the flight was also vegetarian (made special for me). It was a sandwich with veggies and cheese (which I attempted to remove). The best part was the banana! I would suggest ordering a vegetarian meal (you have to do it when you book the flight) even if you're not vegetarian because it definitely looked healthier than the regular options. Your body is already stressed and prone to getting sick when you're travelling so eating the right food can really help. 100th Post and Indy 500 Mini Marathon! Working out for 365 days?! Sweet Potato Mash for Thanksgiving!